Attorneys Thomas and John David Meyer are the founders of the Owensboro law firm, Meyer & Meyer, LLP. At the firm, the two attorneys, who have over 60 years of combined experience, assist both individuals and business clients from throughout Daviess County and surrounding Western Kentucky with legal matters in the areas of business, commercial and corporate law, estate planning, tax law, and real estate. Mr. Thomas Meyer began his legal career in 1971 after earning his law degree from University of Louisville Louis D. Brandeis School of Law and his admission to the Kentucky Bar Association. Over the course of his 40-plus year career, he has served as a senior trial attorney for the IRS and as a justice on the Supreme Court of Kentucky. These positions, along with the others he has held, give him insight that few other attorneys possess. Mr. John David Meyer began practicing law in 1998, and he also earned his law degree from University of Louisville Louis D. Brandeis School of Law. Since beginning his legal career nearly 20 years ago, Mr. Meyer has built a reputation as a dedicated, professional and honest attorney and as a valuable member of Kentucky's legal community. 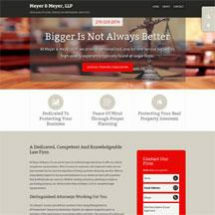 Whether your legal need is personal or professional, you can turn to the experienced attorneys at the law firm of Meyer & Meyer, LLP. If you would like to discuss your legal challenge with one of the firm's lawyers, you can take advantage of their offer for a free initial consultation at the Owensboro law office.